I was floored by the rash and hasty decision by President Trump to attack Bashar al-Assad for gassing his own people when the majority of the evidence points in the other direction, at the Syrian rebels, nothing more than terrorists, who the United States is backing for reasons that confound me. The Syrian rebels are al Nusra, the Syrian branch of al-Qaeda. Terrorists! Anyone remember 9-11, or is that forgotten already? THAT was al-Qaeda, who We the People are now in bed with, supporting and funding them to turn Syria into another Libya. Wonderful! Many fear a great war between the United States and Russia one day. Well, don’t look now, folks, but we are already in one, in Syria, Putin and Russia supporting the legitimate government of Assad, the United States supporting the terrorists trying to depose him and turn Syria into an Islamic state. I believe the most plausible explanation for the chemical attack is that Assad’s barrel bombs, targeting rebel munitions facilities, denoted rebel chemical munitions, releasing the deadly chemicals into the neighborhood. It is most likely that the rebels staged the chemical munitions knowing Assad was coming to attack the facility. And, it is not implausible that the rebels detonated the chemicals themselves. The best policy, going forward, for the United States, is to get the hell out of Syria and stay out! There is one mainstream media publication that finds reason to question the US attack on Assad. In an article for Newsweek, Ian Wilkie is as concerned with the US and coalition rush to judgment and punishment as I am. I consider the evidence that Assad committed this attack shaky, at best. The best way to analyze chemical weapons events in Syria is to try to discern who is providing evidence, why they are presenting evidence and what that evidence comprises. Since the United States’ false Weapons of Mass Destruction (WMD) presentation in the U.N. Security Council led to an illegal, unjustified war in Iraq, it is only prudent to question the motivations of people accusing others of WMD war crimes and demanding regime change based on these allegations. Secretary of Defense James Mattis made it very clear recently that “aid groups and others” had provided the U.S. with evidence that was insufficient to conclude that President Bashar Assad had recently used the chemical weapon Sarin against Syrian civilians. In other words, the Pentagon does not believe what has been presented to it as evidence, chiefly because of the dubious provenance of the providers. The importance of the evidence source is critical in Syria because the jihadis arrayed against Assad ascribe to a doctrine of deception called taqiyya. Taqiyya fully supports and condones behavior such as chemical weapons “false flags” to gain advantage against infidel enemies on the ground. My experience with chemical weapons goes back decades to when I was trained to fight in Mission Oriented Protective Posture (MOPP) chemical gear under the threat of Tabun and VX, deadly organophosphate poisons that kill unprotected personnel within minutes. These substances are even more lethal than Sarin and the infantry took very seriously their presence in the enemy’s quiver. Since then, as a counter-terrorism practitioner and cleared contractor, I have become even more well versed in their technical characteristics to the point that the former Central Intelligence Agency Counter-WMD chief has interviewed me on the record about chemical and other WMD. MilSpec Sarin is clear, odorless and invisible. The “Sarin events” in Ghouta and Khan Sheikhoun did not employ military-grade Sarin munitions. They produced dirty yellow, chlorine-smelling clouds, which suggest either: (a) manufacture by other than scientists of the Syrian Scientific Research Council or (b) an “accidental” bomb drop that hit stored chemicals on the ground, but not (c) delivery of military grade munitions against rebel military targets. Note that I am not trying to make a case for any given scenario; I am merely suggesting that the Assad regime’s culpability is vastly under-proven by the public evidence. Many videos of the White Helmets show them engaged in dubious staging of events, including one from Khan Sheikhoun which shows Uzbek (White Helmet) jihadis engaged in questionable evidence collection. To rely on anything that the White Helmets provide is to share, as we lawyers would call it, the fruit of the poisoned tree, or precisely what Secretary Mattis is alluding to. Chemical weapons (CW) are ghastly, immoral and a red line since even before that term was made popular. The impetus to use chemical weapons is not a strong one since the world will not sit idly by when people anywhere are killed like poisoned rats. 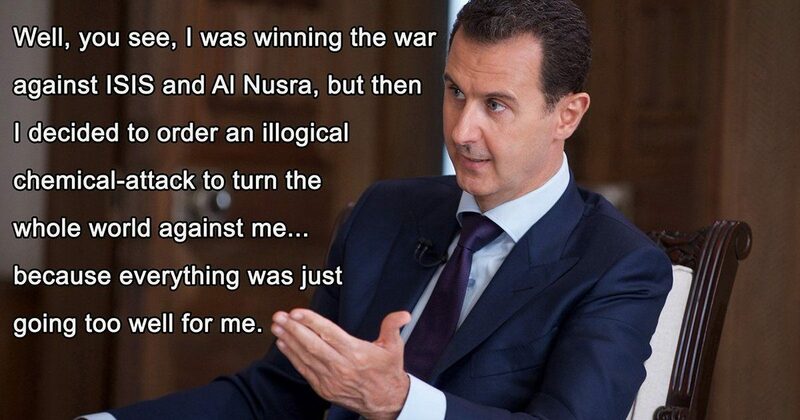 President Assad knows this. He is under the gun, as it were, and under the glare of thousands of cameras. His motivation not to use CW is immense. If America did, for example as it alleges in an official White House report, have evidence it calls “our information” regarding the Shayrat airbase “Sarin attack” being prepared, then why not show this? The intelligence community was more than willing to show Khrushchev’s missiles, but they have no ability to share evidence with the public about Assad today? This defies credulity and calls the “evidence” provided in the White House memorandum into question. Russia and Syria offered the U.S. and U.N. investigators access to the Shayrat airbase, but inspectors refused to go and take samples. Likewise, Khan Sheikhoun was deemed too dangerous to inspect, even though American and English “experts” were in regular contact with the White Helmets on the ground, one of whom, Dr. Shajul Islam, is an accused kidnapper of Westerners. Such evidence as has been provided to the world is not National Security Agency intercepts, satellite photos or the testimony of named intelligence community officials, but the quasi-paid promotional material of regime change boosters such as the White Helmets (a UK government-backed, soldier-founded “medical charity”), the Syrian Observatory for Human Rights (a one-man propaganda shop whose founder is in contact with multiple Islamic State commanders) and tiny bellingcat who made an obvious call on MH17 and used that investigative “coup” to push for yet more interference in the affairs of nations deemed overly pro-Russian or pro-Iran. Never once have these propagandists analyzed evidence objectively, preferring to shoot the messengers such as myself by making ridiculous comparisons to tragedies like the Sandy Hook school shooting in America and misguided theories surrounding them. The best analysis is apolitical analysis, and these groups have shown they have a policy outcome to push, i.e. regime change, not the truth. One need not admire Putin or Assad to exculpate them, if that is where the evidence leads. The war in Syria is a meat grinder. People are dying of disease and starvation as well as high explosives, missiles and, occasionally, chemicals. The use of a banned weapon, even if proven, should not obscure the fact that a majority of deaths and injuries in Syria do not come from unconventional weapons, but more traditional means of killing, bombs and bullets, many provided by America via the “good offices” of the CIA. America wrote the book on WMD and chemicals. We used nuclear weapons against Japan twice and cancer-causing chemical defoliants against Vietnam. There are even credible allegations that U.S. assistance was given to Saddam Hussein in connection with Sarin attacks on Iranian forces. To focus on the Ghouta and Khan Sheikhoun tragedies to paint Assad as an even more diabolical war criminal than he already is rings facile and hollow. Nobody puts down a rebellion, especially a terrorist-enabled one, by following the laws of war.